For this dinner in her home town, Melissa Ragonese, Visual Merchandising and Display Manager at Didriks, was inspired by the colors of seaside Connecticut. The deep teal of the Libeco table linen sets off sand and sky colors of the Heath Ceramics Coupe dinnerware. Place cursor over the photo below for details on each item and their respective links to Didriks website. The colors of the place setting, inspired by the surrounding sea and shore, work marvelously together: the Sabre Djembe five piece place setting in jungle on the Libeco Vence Linen Tablerunner in Teal reminds you of seaweed and the Atlantic; the Libeco Napoli Vintage Linen Napkin flax echoing the off-white color of the Heath Ceramics Coupe dinner plate and salad plate in linen, both of which remind one of the color of sand and stone. The Heath Ceramics multistem vase in brown hold tall blade of seaside grass that reflects the harmony of the Arcadian forests and the north eastern shores of New England. The main reason, I believe, for the success of this al fresco lobster dinner table setting is that Melissa allowed her surroundings to move seemlessly onto the table. 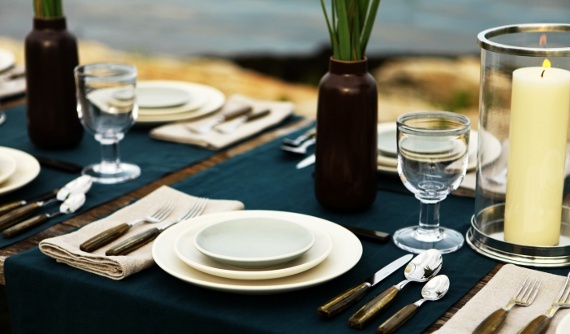 Let nature inspire you and Didriks help make your table setting an inspiration like this one.